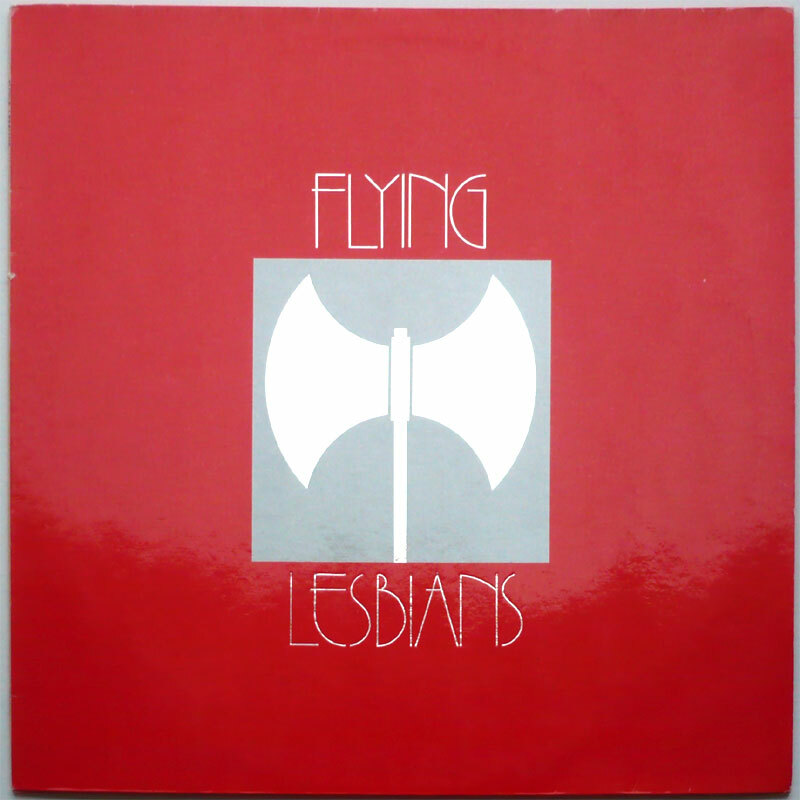 The self-titled, self-released Flying Lesbians LP belongs to the pioneering feminist releases of the 1970s, along Alix Dobkin’s Living with Lesbians LP, or Berlin all-women band Lysistrata. This movement came after the first generation of artists like Gertrude Stein or Claude Cahun on the one hand, and before all-women Punk bands like Hagar the Womb, Malaria or the Riot Grrrl movement on the other hand. While in a male-dominated society Feminist and Lesbian claims generally come across as a provocation, it is all the more provocative in the context of rock music, with its ethos of blatant virility and assumed machismo. 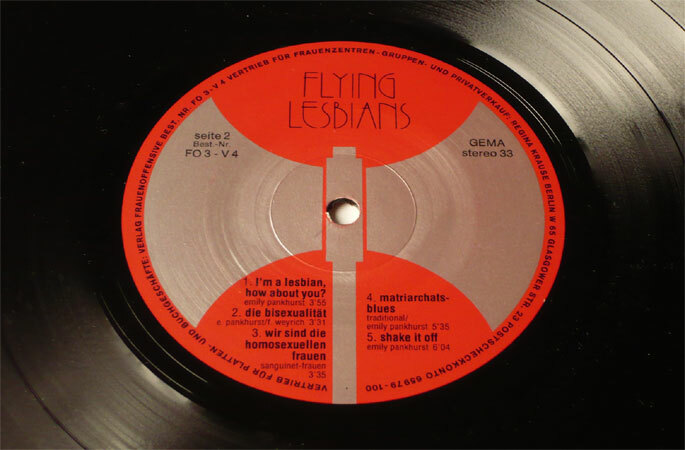 Formed in 1974 by Monika Mengel and Cillie Rentmeister, the Flying Lesbians comprised 7 women from West Berlin performing at Feminist festivals around Europe as well as Frauenfesten (women’s festivals) in Germany. 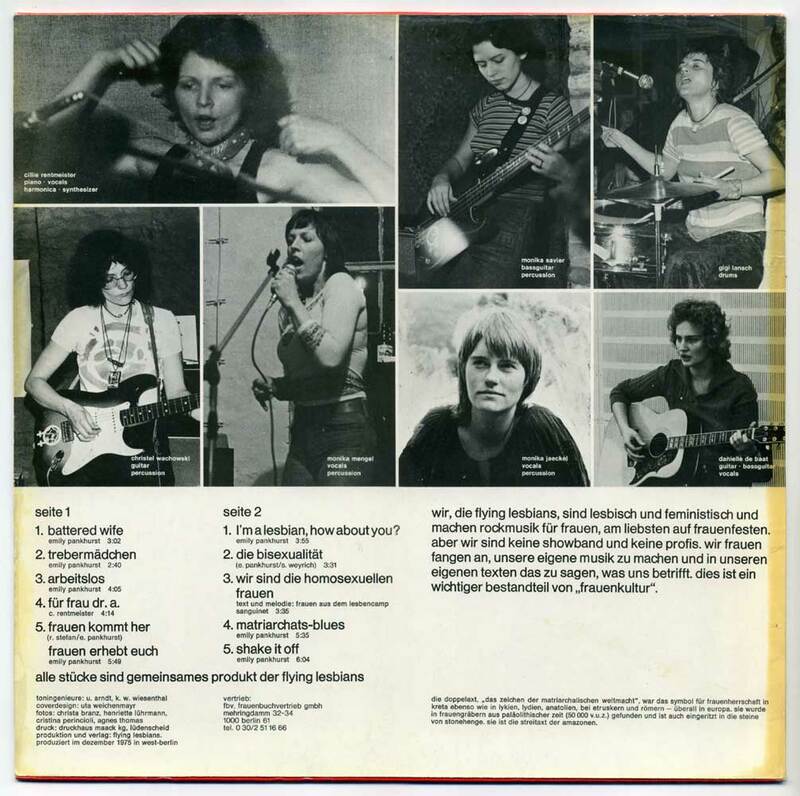 The band lasted from 1974 to ’77 and self-released their unique LP in 1975 via Frauen Offensive, a one-shot record label distributed by Frauenbuchladen Vertrieb GmbH, a Berlin woman-run, national distributor of women’s literature. ♫ Credentials on the LP bear all the signs of a vindicative, activist project, complete with Amazon double-axe symbol on the cover ; lyrics credited to British suffragette Emily Pankhurst (actually written by Monica Mengel and other members of the group) and lyrics in German and English dealing with feminist’s claims exclusively. Musically speaking, the Flying Lesbians have an opulent sound thanks to a strong rhythm section led by Monika Savier and Danielle de Baat’s powerful bass lines, and finally by Cillie Rentmeister’s piano accompaniment, somewhere between Janis Joplin and Czech band Psí vojáci. You obviously have a good memory, to say the least. Could you please reup this?